According to Wikipedia, parallel-parking spaces, the kind that predominate in cities, use a whopping 182 sq ft. If you regularly park in cities, you know where this huge footprint comes from: There’s the length of the car, the space needed to pull out of the space and the irregular gaps that form when various-sized cars come and go. This latter factor often leaves spaces that are one foot too short for your car, rendering large swaths of prime real estate useless. Considering that the micro-units we’ve been talking about measure 160-300 sq ft, the amount of urban area devoted to parking is a huge issue. A couple decidedly experimental housing concepts are taking different tacts in dealing with parking and living in the city. 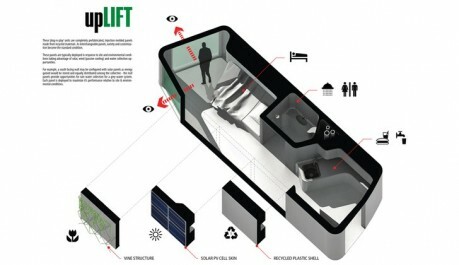 The first is Aaron Cheng’s Parking + Housing, which is an entry in the James Dyson Award. The idea is that urban workers are typically not at home during the day, leaving behind tons of unused real estate. Commuters, on the other hand, come into the city and need space for their cars. P + H reconciles these needs by having a pneumatic structure that compresses during the day to provide parking for commuter (above). During the days, the structure extends to reveal a single-unit apartment (below). Furniture moves with space in its transformation (see video below). The idea, while interesting, has some big gaps in logic like late nights at the office. Do the apartment dwellers have to wait til the project is done? Or sick days. Do commuters need to park elsewhere? 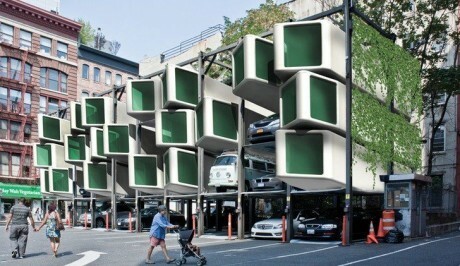 The other concept is called upLIFT, which inserts prefab housing units in existing parking structures, such as the parking elevators common in New York City (below). The project was part of the HOME competition run by Building Trust International, which sought to find single occupancy housing solutions for under $30K. The panels of the structures are made of recycled material and designed to incorporate rainwater collection, solar panels and vine-walls. What is interesting about upLIFT versus Parking + Housing is that it chooses to design around a less car-dependent future rather than accommodating commuters. Then again, it does little for the present, with it’s full lots and clogged streets. 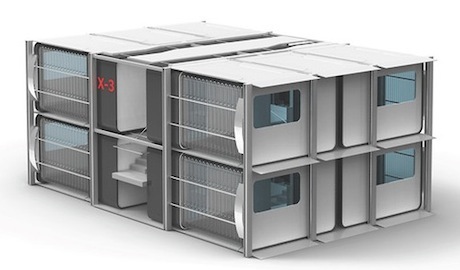 Both of these concepts seem to dwell in possible futures more than suggest real solutions. In terms of real solutions, congestion pricing is a low-tech, yet effective way of keeping cities free of cars. What the often-unpopular-policy does is charge cars for entering certain zones of a city at certain times. London, a city who has instituted the policy since 2003, charges £10 ($16) for entering its congestion zone. One 2007 study found that traffic within the zone was reduced by 30%. While we couldn’t find parking statistics, it’s fair to say that there was a commensurate effect on parking as commuters who would otherwise park in the city leave their cars at home. Of course, there are smaller cars and any form of two wheel transportation, both of which take up a fraction of the space that conventional car parking does. What do you think? Should we design our cities with cars in mind or is that like laying new telegraph lines across the Atlantic? Where is the parking for those who live in the apartment when they are home? Do they rent out the parking spaces to offset the cost of apt living? Just on a side note, and this applies to anywhere (not just London), I’m of the opinion that charging cars to enter congested areas is a superficial way of solving the problem. Is there an underlying problem perhaps? which once solved, there will be less congestions, pretty much automtically? A problematic public transport system for example. My dad used to park in Hoboken and then take the Path train into the city, which he did for over 20 years. I think the real question is why anyone needs to drive into the city. Have them park outside and then shuttle them in with a bus or bring them to train station. I don’t think we should design cities with the car in mind. I think we should design cities around transit hubs. Build more subways, bus lines and shuttles. Reduce liability and change laws and regulations so businesses can let people park in their lots after hours.